Fare enough. Using “Throwback Thursday” might well reflect a certain “lack of not having a real entry to post”. This image though reflects both a certain oddity, or strangely cool quality that, one doesn’t often associate with a normal school. So, what do we have here? First the image orientation: we have a nice historic image of campus (circa 1920), from the Arizona Historical Society Northern Division-whose images we house in SCA. We’re looking northwest towards the east side of Campbell Hall (built 1916). To the left of that is Hanley Hall (built 1912, now long-gone), and Bury Hall (built 1908). The photo was likely taken from a location close to the present-day South Beaver School, or the Chemistry building-close to the school’s original athletic field. The subject of the photo is clearly the two automobiles racing. What is interesting is that these aren’t mere jalopies. The one on the left appears to be a purpose built machine, whereas the one on the right might have started life as a production automobile- and note what appears to be a ride-along mechanic. Obviously there are spectators (not very safe ones at that), and a whole lot of questions. Was this really a sanctioned event? Why were these cars in Flagstaff? Were they local, or passing through heading to larger venues? Race cars at a normal school? 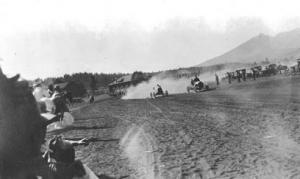 I think this a fine “Throwback Thursday” image- our campus from almost a hundred years ago, vintage cars-racing no less, on what appears to be a fine, sunny afternoon. One that isn’t likely to happen at NAU quite this way ever again.